Transistor wastes no time in jumping straight to the action. Rather than a long preamble to set the stage, the first thing you see is the protagonist looming over a dead body impaled by a massive sword. It’s a striking scene – one that raises tons of questions, but provides no answers. Transistor simply trusts you’ll stick around to find out for yourself. And you’d be foolish not to. For not does it deliver an intriguing story, but an exquisite game as well. 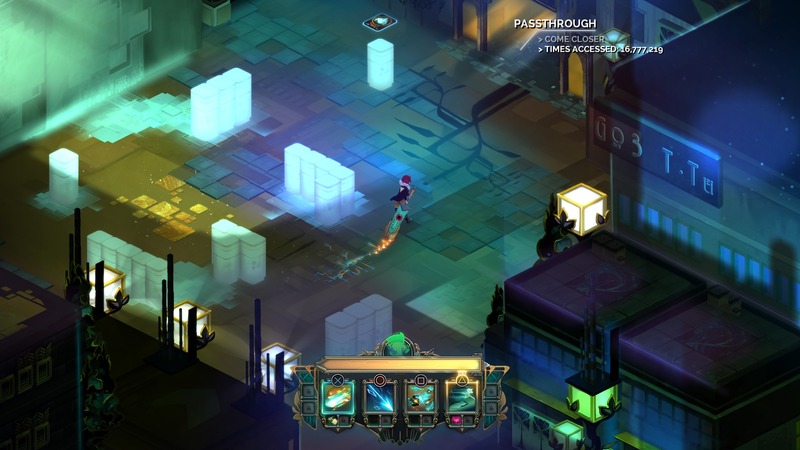 Transistor comes from Supergiant Games, developers of 2011’s Bastion. Despite the two games carrying many similarities, they feel nothing alike. Where Bastion was heavily action oriented, Transistor is more tactical. Where Bastion was bright and fantastical, Transistor is subdued and grim. Set in the futuristic metropolis of Cloudbank, Transistor follows Red, a signer on the run following a botched assassination attempt on her life. She escapes with her life, but not her voice. The Transistor – the sword she carries – is all she has now, which possesses the consciousness of her beloved. The sword suggests they skip town, as an event known as “the process” begins erasing the city and its inhabitants, but Red has other ideas. She wants answers. 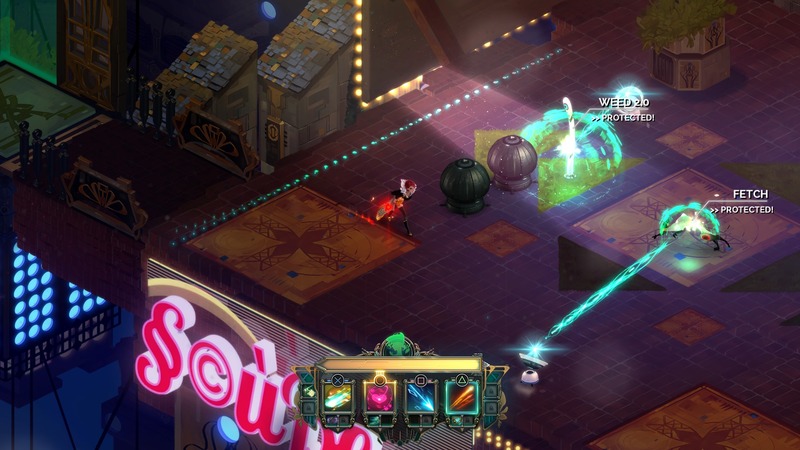 In typical Supergiant tradition, Transistor is heavy on story, but not at the cost of player agency. Cutscenes are forgone in favor of environmental storytelling and makeshift narration, this time through the sword. But instead of simply telling you what’s going on, he’s an active participant in the action like yourself. The voice of the Transistor isn’t an all-knowing presence like Rucks of Bastion was. He’s right alongside Red for the entirety of the journey, learning about the situation themselves as much you are, making him more of a companion than a narrator. And welcome company at that. His frequent commentary provides a small glimpse into certain aspects of Cloudbank, often bringing a touch of lightheartedness to the proceedings. The data that accompanies points of interest speak to the strange nature of Cloudbank. Cloudbank is a fascinating place. It’s a city run entirely on democracy, the people deciding everything from what the weather will be, whether they should build railways, parks, or whatever suits their needs at the moment, and even the color of the sky. Terminals placed across the city host these polls, adjusting the landscape at will. It’s a sprawling, breathtaking place. A real marvel to behold. Or it would be if it weren’t so unnerving. Wandering through the empty streets, watching your back for any sudden ambushes, makes the place feel unsafe. Vibrant lights and color give each district a sense of liveliness, but combined with the low, steady hum of the music, it creates a sense of unease; that trouble could be lurking around every corner – which often proves to be the case. Exploration typically leads to trouble, enemies spawning almost always as you turn around from a dead-end or other point of interest on the side. Enemies emerge from the ground, quickly surrounding you. Luckily the Transistor makes fighting back a cinch. Combat is a mixture of real-time and turn-based action. You can unleash attacks on the fly or you can freeze time to enter a planning mode to take a more tactical approach. By doing so, you can deal more damage by queuing up attacks and scoring backstabs, as well as dispatch foes more efficiently, but also leave yourself vulnerable once you’ve executed your turn. Every skill – including movement – has a certain cost. Each takes up sizable portion of the turn bar at the top of the screen. Once it’s filled, your plan plays out. Time then resumes and Red begins dashing about, hastily executing each command. Nothing’s set in stone, however, as time merely resumes to a slow-motion state. Opponents can still avoid your attacks, causing you’re carefully laid moves fall apart and leave you wide open if you’re not careful. Plotting out your actions proves crucial to your survival as the game goes on. You have be aware of their movements and how your actions are going to affect them. Just running up to the nearest foe and swinging away on them isn’t going to do much good. Sure you may slay them, but if it leaves you in a bad position, then chances are you might not be able to grab their core to prevent them from reviving themselves. Conversely, playing it too safely means you’ll quickly find yourself overwhelmed by the odds. It’s a delicate balance. Which is why Transistor’s combat works. It combines the minute-to-minute intensity of real-time battle with the calculated approach of turn-based action. It feels tactical without being slow or rote, constantly forcing you to think swiftly on your feet. Never is it as simple as just herding foes into the right spots to unleash hell. They’re not easy to bend to your will, working in concert to keep the pressure on you at all times. Your plans have to come together fast and in the moment, working with whatever you’ve got to gain the upper hand, even if it sometimes means placing yourself in harm’s way. As enemies grow stronger, gaining new abilities that make them tougher to approach or attack, it becomes all the more important to find a combination of abilities that works best for you. Up to four active skills (known as functions) can be equipped to the Transistor at a time, each able to add an additional two skills on top of them to modify their attributes. A mere sword swipe can be retooled to fire projectiles, for example, dashing configured to unleash corrosive parasites that home in on nearby targets; bombs can reworked to stun foes, allowing you to follow up with a crushing explosion, and so on. The possibilities are seemingly endless. Every time I stopped by an access point – where you can change your ability load-outs – I was always discovering new, more effective sets. I was never able to settle on a single build, because I always wanted to see what new pairings of skills I could come up with and how they performed. Even if it ended up placing me at a disadvantage, I never felt like any of them were a waste, as I could always find something they were effective against. 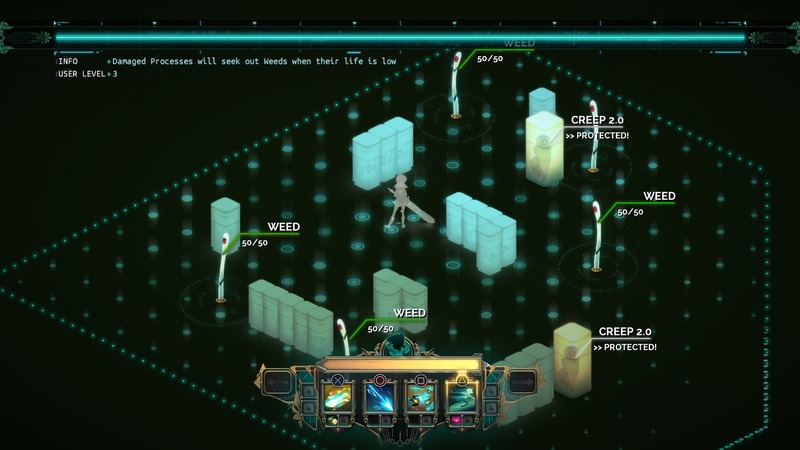 Only Transistor could take such common words like “weed” and “fetch” and turn them into something menacing. Performance challenges are exemplary of this. Here, you’re dropped into a specific scenario – defeating a group of foes in, say, thirty seconds, clearing an area of enemies in a single turn, or enduring multiple waves of enemies with pre-determined functions – to test your abilities. None of these can be completed without forethought and extensive, meticulous planning, as they’re essentially puzzles. Just running about attacking everything in sight recklessly won’t get you anywhere. Because they often decide which skills you’ll be able to use, they force you to learn how to master them all. Sure the practice room essentially does the same, but the tests are more effective because you’re asked to learn them under pressure. They allow you try out skills you haven’t gained access to early, see how they fare in a real combat scenario. Moreover, they teach you to be a better tactician. Where the weapon challenges in Bastion were mere feats of skill, Transistor’s tests act as lessons. They make you more conscious of positioning, turn costs, and so on. Things you know are important, but don’t often give too much thought when in the heat of battle. Things that become more and more crucial over time, giving you a leg up in the end-game and beyond, especially if you decide to start enabling limiters. Limiters increase the amount of experience you earn in battle in exchange for making things harder. Everything from making enemies deal more damage to locking out more functions upon near-death are available, each new limiter pushing the odds ever more in the process’ favor. They’re unlocked as you gain levels, able to be togged at any access point you come across along with your active abilities. Though they don’t truly come into play until you start Recursion Mode, Transistor’s take on new game plus, wherein the enemies you face are randomized instead of scripted like in your initial playthrough, along with a few other extras. Transistor is an exceptional game. Few games exhibit such pure, unadulterated craft. From its fantastic story to the enthralling combat, every facet of it exudes nothing but excellence. It’s an exquisitely crafted game, providing just about everything you could ask for and more, constantly outdoing itself. It’s a game that only gets better every time you play because there’s always something more to be discovered. Transistor is truly something special. Nice write up for Transistor. I cannot wait to play this on ps4. I loved Child of Light, I’m betting I’ll love this game too! Then onto Watch_Dogs…then E3…then……..the wait for the goodness that E3 drops on us. It’s a good time to be a gamer.